The E2DL Defender LED Flashlight performs double duty as both a high-quality, everyday flashlight and a reliable self-defense tool. 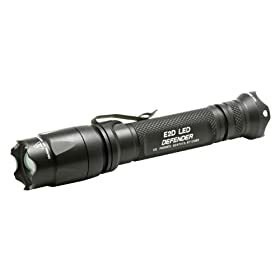 The durable and compact flashlight provides dual-output LED lighting with a virtually indestructible power-regulated LED emitter. With a tactical high mode of 200 lumens, the E2DL Defender can overwhelm an aggressor's night adapted vision instantly. The Total Internal Reflection (TIR) lens focuses the light into a powerful beam that will still cast a wide enough swath for peripheral vision. Meanwhile, the flashlight's scalloped tailcap and Crenellated Strike Bezel provide additional tools for your defense. The E2DL Defender is operated by a pushbutton tailcap that allows you to activate the light's high beam instantly or select between modes. The low, 5-lumen output offers runtimes of up to 76 hours for long-term, navigational use. Built to last, the E2DL Defender features a mil-spec type III build of hard, anodized aerospace aluminum. The handle is textured for a secure grip, and the flashlight is equipped with a belt clip for easy carrying.